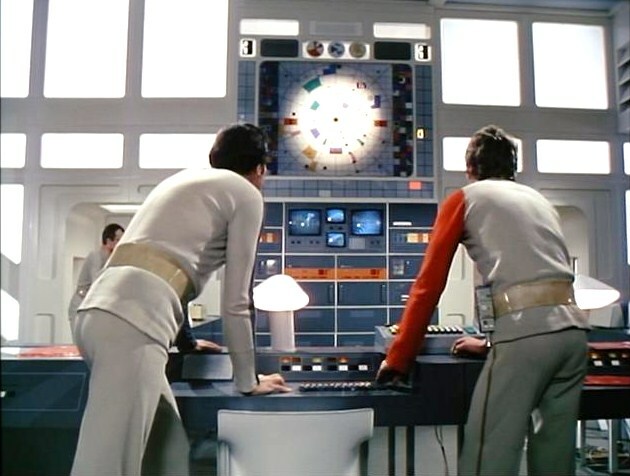 "Space: 1999" had a style, a feel, a look of its own." - Martin Landau (Lee Goldberg. Starlog: "Martin Landau Space-Age Hero." July 1986, page 45). 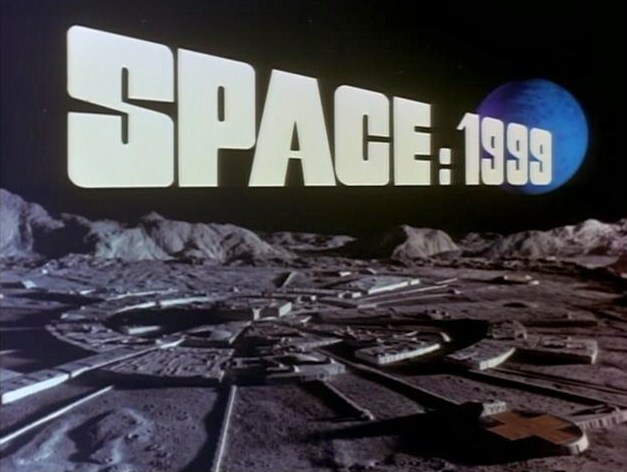 "...Space:1999 is like Star Trek shot full of methedrine. It is the most flashy, gorgeous sci-fi trip ever to appear on TV. Watching it each week is very close to being under the influence of a consciousness altering drug. - Benjamin Stein. The Wall Street Journal: "Sailing Along on a Moon-Base Way." 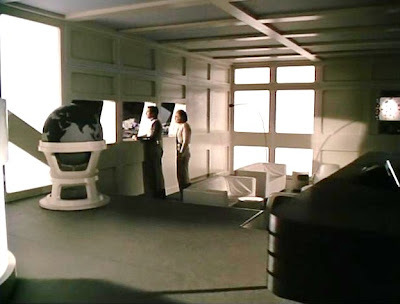 Though TV reviewers were often quick to criticize the storylines on Gerry and Sylvia Anderson's Space: 1999, most nonetheless agreed that the visualizations of this classic series were unimpeachable. For example, TV/Radio columnist Charlie Hanna termed the sci-fi program a "visual feast," and The New York Times critic John J. O'Connor noted that the "visual lavishness is apparent from the dazzling array of electronic gadgets and hardware to the "moon city" costumes designed by Rudi Gerneich." In the same vein, Newsweek observed that "Not since Stanley Kubrick's '2001' have sci-fi freaks had the chance to trip out on so much surrealistic gimmickry." I can add my own testimony to this effusive praise. When I initially watched Space:1999 back in 1975, I was certain that this was indeed what the future would look like. It just seemed right and appropriate that by the year 1999 we'd all be able to communicate across mini-tv screens thanks to devices such as the useful commlock. And, of course, furniture and interior decoration would be immaculate, minimalist, and stream-lined by the eve of the 21st century, right? Okay. It didn't quite turn out that way, but you can't convince me that it shouldn't have turned out that way. 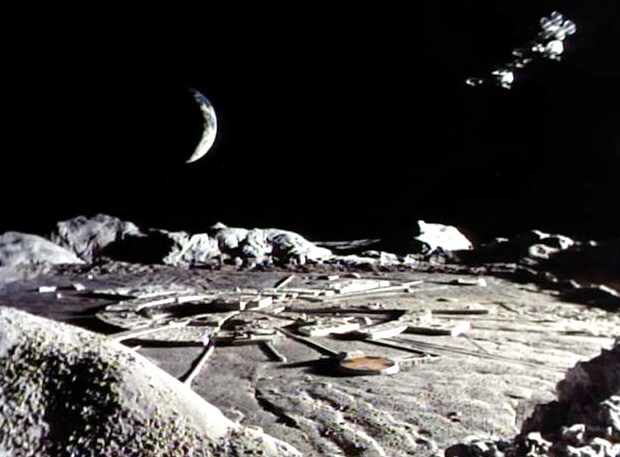 So for today, and my third installment of Sci-Tech, I want to present some of my favorite imagery of Moonbase Alpha from Space:1999. 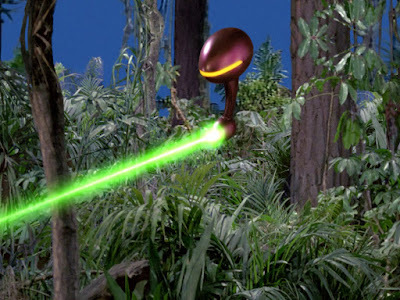 As you may recall from my previous entries on Star Trek's "The Cage" and Land of the Lost's Altrusia, the mission of these infrequent Sci-Tech posts is to gaze at the technology/production design/effects work of popular cult-tv series. In practice, this is quite an extraordinary combination. Despite the clean, minimal lines of Moonbase Alpha construction, crew quarters boast a sense of individuality and recognizable humanity ("Matter of Life and Death. 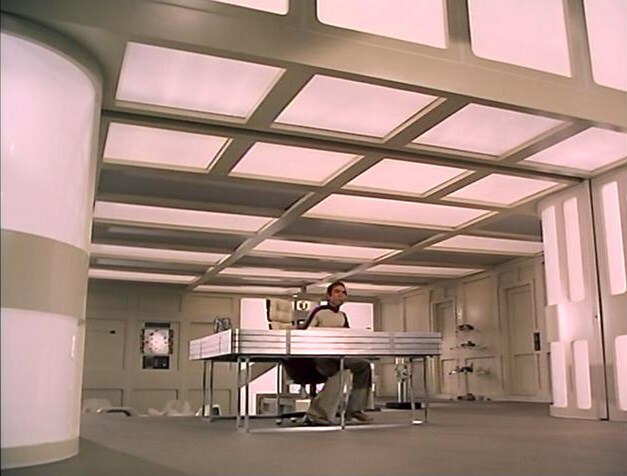 "), Areas of heavy use such as laboratories, as seen in "Breakaway" and "Voyager's Return," are cluttered and over-crowded. In other words -- despite the immaculate white conception of Moonbase Alpha -- man will be man, even in the future. He will use the "space" on the Moon in just the way he does here on Earth; and that way isn't always clean and austere...or even neat. Victor Bergman's laboratory is another example of this design approach. Secondly, the designers of Space:1999 didn't skimp on a sense of scope, meaning that the vistas and views of Moonbase Alpha appeared more legitimately cinematic and impressive than virtually any other sci-fi series sets in history up to 1978 including Star Trek, wherein the Enterprise bridge famously did not include a ceiling. 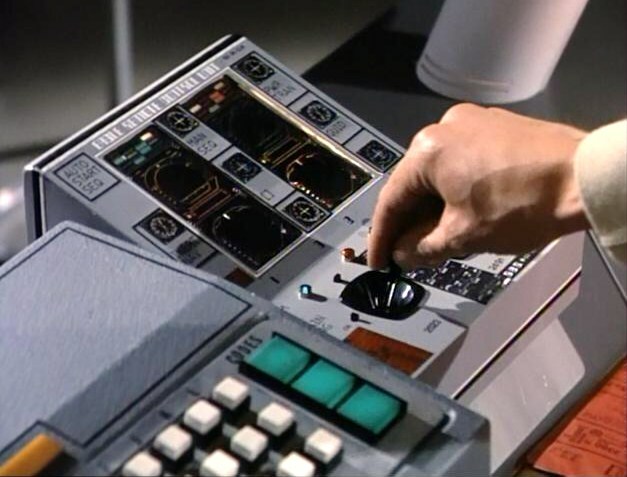 The control center of Moonbase Alpha, Main Mission, is a perfect example of this aesthetic. It is a vast, two-story affair replete with a ledge and observation area, as well as a kind of mission control pit where analysts toil on a regular basis. Attached to Main Mission -- with a wall as a huge sliding door -- is the Commander's office. For privacy, Commander Koenig can shut the door to Main Mission. In cases of emergency, he can open the door, and his desk overlooks the Big Screen and his workers. What must be noted about this is that both Main Mission and the Commander's office are vast. The two (joined) sets present the appearance of a real life, sprawling complex. Scope is sometimes achieved other ways on the series as well. Miniatures do the trick to convey passage on the useful Travel Tube, and in rare instances, Space:1999 joins live-action footage with rear-projection footage of Eagles and their hangar bay. Again, there's a powerful aura of a fully-operational Moonbase here. Third, and equally important, the amazing technology and design of Alpha and the Eagles were merely the starting point of this adventure. Week after week, our impressive views of Earth's high-tech turn-of-the-century moonbase were one-upped, essentially, by mind-blowing alien landscapes and worlds, as featured in episodes such as "Guardian of Piri," "Missing Link," "War Games," "The Last Enemy" and so on. After many of those trippy adventures, the high-tech environs of Moonbase Alpha felt not like a dazzling vision of a future age, but rather like "home," even fostering a sense of security. 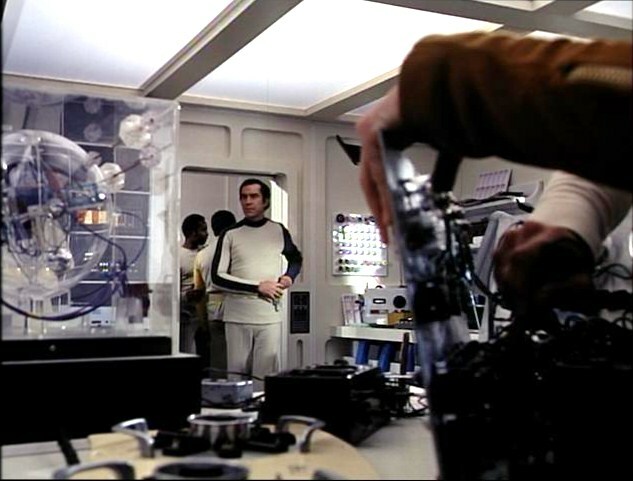 By creating alien worlds of such blazing distinction and originality, the makers of Space:1999 actually made their "future" Earth technology seem all the more believable (and desirable). It would be impossible to write this post without commenting just a little on the Eagle, one of the most beloved spaceship designs of cult-televisions. These craft are perfectly in keeping with Moonbase Alpha: as remarkable embodiments of "near future" technology. No flying saucers or stream-lined nacelles in this world. Rather, the utilitarian Eagles consist of interconnected modules, retro-rockets, landing pads and nose-cones. All these facets are recognizable as dramatic extrapolations from the then-current Apollo program. 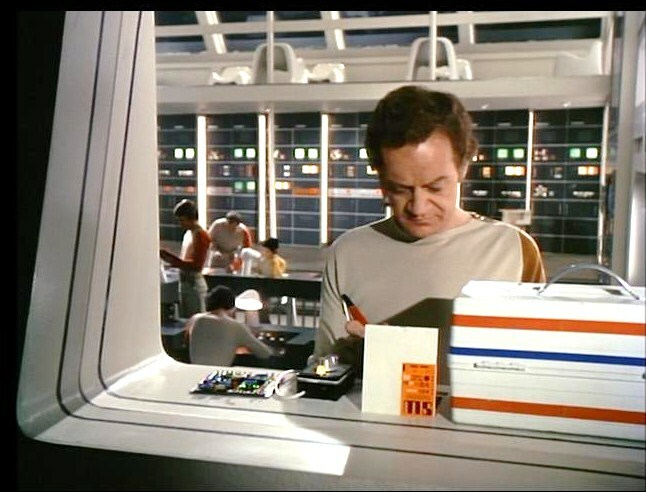 Again, Space:1999 had one foot in the future, and one in the present. "I was in my "modular" design mode in those days. I reasoned that it made sense to make Pods that were interchangeable. The command pod could serve as a lifeboat, Eagles could be "chained" together, etc...My basic ideas came from looking at dragonflies and insects of all sorts. I copied nature to some degree - I think it made the Eagle believable." Believability, scope, and then imagination. 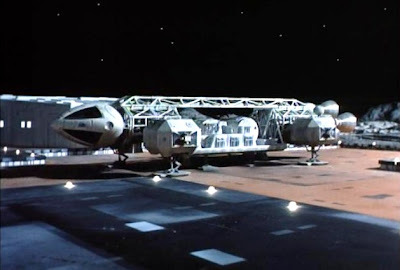 These are the sturdy foundations of Space:1999's set and model designs. 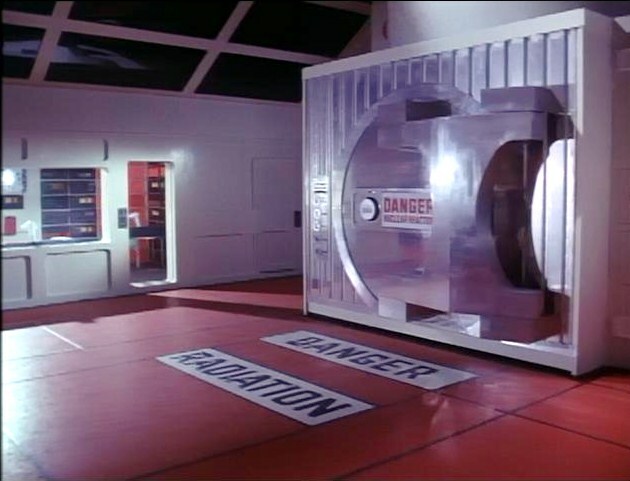 Below is a brief gallery showcasing Moonbase Alpha as it appeared in Year One. Finally, I should add that these sets, models and designs look even more remarkable on Blu Ray. Looking up to the Commander's office. Gazing at Main Mission's "Big Screen." Minimalism meets clutter: a fully functioning machine laboratory. A Room with a view. Note the globe of Earth cast in gray and black to match the rest of the set. Clock, communicator and more: The comm-post. Against a backdrop of stars: a repair-man with a tool kit. Remote control flying an Eagle. A nuclear power plant of the future. Behind our heroes, a hanger bay filled with Eagles. As an unabashed and unapologetic fan of this series it is always nice to see it championed. So often, even now, it is harshly judged by fans of other, more popular franchises. Yes, it has its faults, but the vision and SFX of this series were unique in its time, and still hold up exceptionally well today (especially Y1). Watching the series on Blu-Ray recently, I remain impressed at just how excellent the model work on the Eagles and Alpha look, and the set details are phenomenal. Compared to the CGI on scifi shows in the 1990s (namely Babylon 5) and early 2000s, I challenge one to be honest when commenting on which show's SFX look dated! Jane: I am open to whatever really looks best (and by that, I mean photo real). I think that CGI has made some strides over the last few years (Avatar, for example), but I still love and admire the old school look of programs like Space:1999. To my eyes, it just looks real! Thumbs up on the Space:1999 scifi tech John. I think the transport tube was my all-time favorite thing on that show. That tube made the place feel big. Scope! Just like you said. The Eagle remains perhaps the single greatest piece of spacecraft engineering ever designed for television or film. I think it holds the number one spot in my heart just in front of the Enterprise. I always loved the metal super structure. In fact, I love everything about the Eagle. Late, but I wanted you to know I enjoyed your Space:1999 Sci Tech post! Great analysis as usual. Would the show be held in higher regard if there wasn't such a change in tone from Y1 to Y2? I loved the alien spacecraft btw. SFF: I concur with your feelings about the Eagle spaceship. It is really an impressive design, and IMHO the greatest spaceship in TV history. 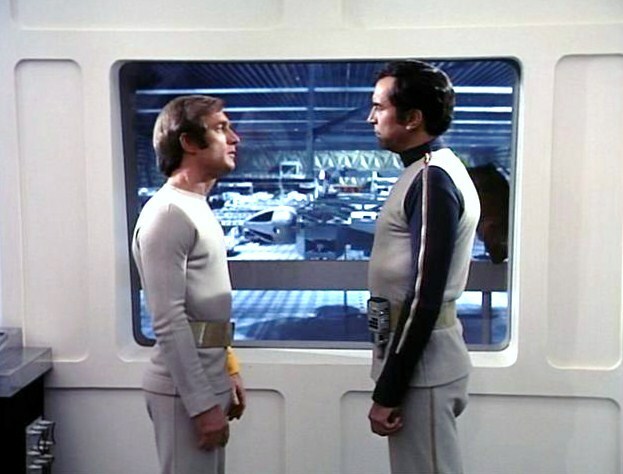 It's one reason I worry about a space:1999 remake. They'd fool around with the Eagle, and, well, you can't improve on perfection, can you? jdigriz: You bring up an excellent point. I think that if Space:1999 had stuck to its original format, or at least the original tone, it would be heralded today as an absolute classic, and one of the five best sf series ever made. 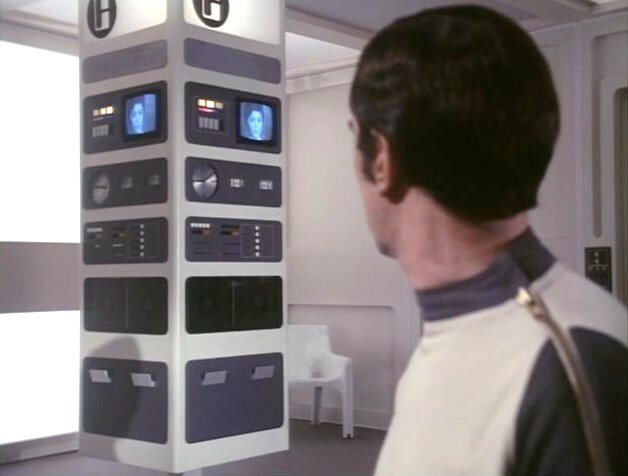 Design-wise, my favorite set piece from the series are the colorful computer panels from the second series Command Center. These were designed by Reg Hill (not Keith Wilson) and originally used for 'Into Infinity'. Though Main Mission was grand, some of the details were weak. Sandra's station was little more than flashing lights and an illuminated 'pie chart' intrument. (It certainly wasn't an improvement over Uhura's Enterprise station). The Main Computer panels featured clusters of unmarked key pads...good luck finding the right key. The illuminated cartoon graphs were rather lame. They certainly didn't look like real monitors. For the second series, the work stations were given monitors which were certainly more useful for gaining information (than just flashing lights). Another weak point in the first series was the ever changing medical center. It changed frequently. Viewers expect some continuity throughout a series. Looking at such coffee table books as "The Art of Star Trek' and "The Art of Star Wars", I've always thought that Space:1999 deserved its own book. It certainly featured some of the most impressive design work in all of tv history! I agree about this seriously under-appreciated series. The Original Series Enterprise might be my favorite sf vehicle, but the Eagle is a close second. 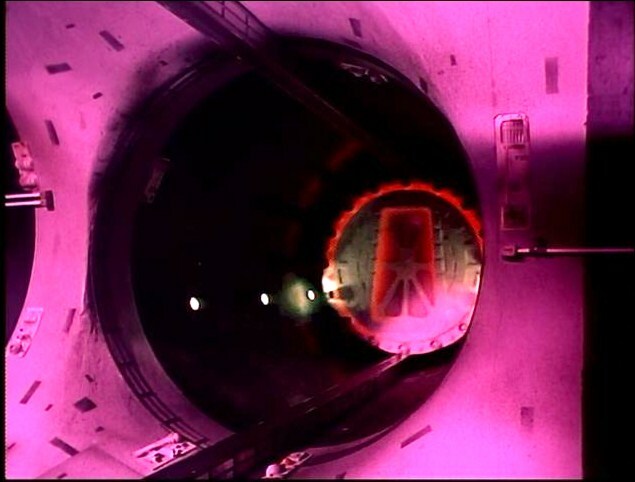 The realism factor in the sets and effects and models is, IMHO, the highest of any science fiction. Only Ron Howard's Apollo 13 truly approached it, and that was based on reality. I think the show hit its peak late in the first season. I watched scattered episodes in the first season, and got some of the story records...and them my mom watched Force of Life with me. Instant ban from the horror of the show... I sneak-watched The Rules of Luton (LOL), so between that and the first part of the Starlog article, I knew who Maya was. But the best episode for me was Dragon's Domain, both for story and ships and effects. I agree with you about the realism factor in Space:1999's spaceship designs, and also your assessment of the series' strongest point. Although I'm partial to the aforementioned (and horrific) "Force of Life," I can't disagree that the span which brought us episodes such as "Mission of the Darians," "Dragon's Domain' and "Testament of Arkadia," among others, is a real high point.